Avoid driving while you're fatigued. 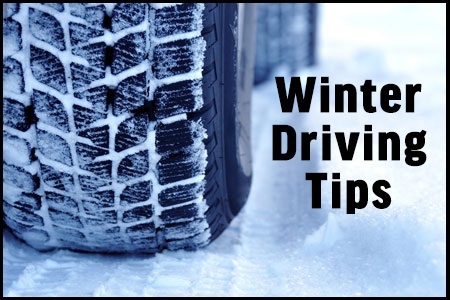 Getting the proper amount of rest before taking on winter weather tasks reduces driving risks. Make certain your tires are properly inflated. Keep your gas tank at least half full to avoid gas line freeze-up. Do not use cruise control when driving on any slippery surface (wet, ice, sand). Always look and steer where you want to go. Accelerate and decelerate slowly. Applying the gas slowly to accelerate is the best method for regaining traction and avoiding skids. Don't try to get moving in a hurry. Take time to slow down for a stoplight. Remember: It takes longer to slow down on icy roads. Drive slowly. Everything takes longer on snow-covered roads. Accelerating, stopping, turning - nothing happens as quickly as on dry pavement. Give yourself time to maneuver by driving slowly. The normal dry pavement following distance of three to four seconds should be increased to eight to ten seconds. This increased margin of safety will provide the longer distance needed if you have to stop. Don't power up hills. Applying extra gas on snow-covered roads just starts your wheels spinning. Try to get a little inertia going before you reach the hill and let that inertia carry you to the top. As you reach the crest of the hill, reduce your speed and proceed down hill as slowly as possible. Don't stop going up a hill. There's nothing worse than trying to get moving up a hill on an icy road. Get some inertia going on a flat roadway before you take on the hill. Stay home. If you really don't have to go out, don't. Even if you can drive well in the snow, not everyone else can. Don't tempt fate: If you don't have somewhere you have to be, watch the snow from indoors. For more information regarding the Pledge, visit www.trafficsafetycoalition.com. The Village is currently awaiting bid results from the Illinois Department of Transportation. Construction is slated to begin this summer. This project is partially funded through a $1.5 million dollar federal grant and a $100,000 dollar state grant. Due to the escalating costs to repair the damages associated with the repeated vandalism, the temporary shelter at the Cary station on the Metra UP-NW Line will be closed at noon April 4, 2019. The existing depot building is available for use until the new station along the inbound platform is completed later this summer.